Like most ten-year-olds, EVE celebrated its birthday on the nearest weekend (just past), rather than the actual date (today), in order to maximize the fun. I’m pretty glad they did. My mom-in-law’s in town, the kids had a cool brass concert to go to, I’m wrapping up a bunch of MFA projects at the moment, and had a book review go up at the Mittani — all of which meant that while I was at my computer a lot this weekend, it wasn’t as often as it might have been, and I wasn’t always logged into the game. Saturday was the Tuskers third Frigate Free For all, which was extremely conveniently located all of one jump away from one of our lowsec staging systems. I brought over one ship (a super-long-range Atron that lived a lot longer than I expected), and after that I made use of the prefit ships provided by the Tuskers for the event, trying my best to fly ships from every faction, and as many different kinds as I could. Some of the prefit ships were a little kooky (or shamefully short of ammo), but they were all fun in their own way (probably the most fun was a microwarpdrive + blaster fit Incursus), it was SO NICE to just dock up and say “give me something Gallente” and just get it, and I had a ball, as did the other pilots from our corp who joined in. A couple mis-clicks cost me a few decimal points of security status, but I’ll live. I could only stay for about one-sixth of the event’s duration due to aforementioned kid’s brass concert, so I left my corp mates to the carnage and headed out. After the concert, I found out the FFA was still going on, having upgraded to destroyers in my absence, so I ran over to our staging station and picked up a sniping catalyst that has been gathering dust in my hangar and flew around sniping at random stuff, which unexpectedly led to a fun 1v1 fight between me and someone from Black Rebel Rifter Club, above a lonely moon on the edge of the system. Good fight, and I called a personal end to the event with that. Final tally: due to my limited participation, “only” racked up 60 kills and 14 ship losses. Two of my corp mates made the top 25 killers for the event (one in the top ten), and our corporation registered 252 kills (including a Thanatos carrier) and 49 cheap-o losses. So much fun. Saturday night, I decided to take the advice of someone from the EVE303 google group (Eve players in Denver) and did a long haul across enemy territory to HED-GP, a null-sec system where “things happen.” I noticed a lot of pilots from Bombers Bar in the system, and as I’m known to them, I joined their fleet and spent a little time plinking at various TEST pilots and trying to save as many tactical bookmarks as I could. (Meanwhile, back in our normal stomping grounds, Meg and Sthaz took part in massacring a pirate Battlecruiser fleet, so probably I selected the wrong activity for the night. Oh well.) I left the bomber in a station over in that area, in case I feel the need to terrorize TESTies again, and headed home. Sunday was a big day, with lots of activities planned around New Eden to celebrate the game’s ten year anniversary. The big one was the Flight of 1000 Rifters, in which Marlona Sky arranged to sacrifice a super-carrier to whatever pilots showed up to take the ship down. Red vs. Blue planned to be there, and started up the day with an early roam/ship move once the location of the event was announced — I joined their fleet simply to have a couple hundred allies in the impending brawl. Having flown in the Free For All the day before, I wanted to make sure I’d have more than enough ships on hand, and risked a cheap hauler to bring twenty executioners into the just-announced system, then hopped into an Ares interceptor to join the RvB gang on a roam to kill time until the 1000 Rifters event. After a bit of meandering, the fleet managed to intercept a CCP Developer Fleet that was flying around in brand new Gnosis battlecruisers (prize ships given out to pilots for the 10th year anniversary). Many, many ships exploded, and honestly I’m not as happy about the CCP devs I got to shoot as I am about this ship loss. I’ll say this about the Dev fleet (led by, I’m assuming, CCP Fozzie): they had good target discipline. I was locked, targeted, and then single-volleyed off the field at the precise moment one of the Devs managed to pull my into a hard turn that slowed my Ares down juuuust enough to hit. POP goes the interceptor. Once we got done shooting devs (I logged a shameful number of CCP kills in a rookie frigate I picked up after losing the Ares), it was time to get to the supercarrier killing. Most of the shooting wasn’t really directed at the supercarrier as much as the other pilots (in true Eve style), so many many ships exploded, none of which were mine (surprisingly). Somewhere in there, Eve set a new record for concurrent connected players, just north of 65 thousand players. I’m glad I did the 1000 Rifters event, but it was not nearly as fun (thanks to time dilation and unavoidable lag) as the (admittedly smaller, with “only” 300 pilots) Free For All the day before. Logged out, played with the kids, wrote some more of my final paper, watched Doctor Who, and saw an email from CB that we had some visitors to the wormhole. No one was in comms when I logged in, but I spotted a few unfamiliar ships on scan. After about 15 minutes of stalking, I found a Noctis salvaging ship sucking up wrecks in a Sleeper site, and watched as his four battlecruiser bodyguards warped out and left him all alone. Welcome to the Wormhole. Watch that first step. Ooops. I crept up on the Noctis in a stealthy little Tengu strategic cruiser named (of course) Bad Penny, and a half-dozen volleys later I had a dead ship, a hold full of sleeper loot, and a nice little bow with which to wrap up the weekend. 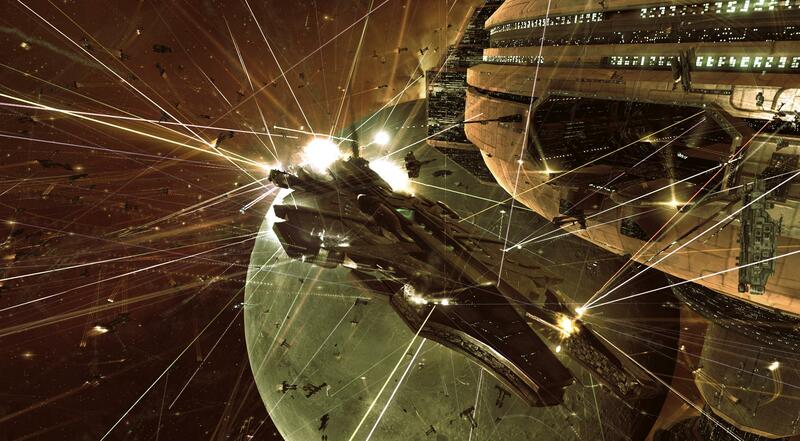 Happy Birthday, Eve Online. Here’s to the second decade.